Antique furniture is not as costly as you might think. While you may be unable to afford an original William and Mary highboy, most people find that they can add a Victorian table to their home without breaking the budget. Even experts disagree sometimes on what constitutes an antique and there is really no exact answer. In 1930, the United States government decided that in order for an object to be labeled as an antique it must be at least 100 years old. This was a business decision since antiques were allowed to be imported into the country duty free. It really had nothing to do with the antiques themselves. Since that time, many antiques dealers go with the rule that an item must be a century old to be labeled an antique. Others believe that an item should have been created prior to the 1830 date decided on by the United States customs department way back in 1930, and still others believe that an antique is anything over 50 years old. To further cloud the definition, a car is considered an antique when it is 25 years old. Most people go by the rule that a true antique must be 100 years old. The furniture made during this century was usually sturdy and utilitarian. The Jacobean style lasted from about 1600 to 1690 and was characterized by straight, heavy proportions. This is the style most people think of when they think of medieval styles and castle furnishings. Early American style is categorized by furniture made from 1640 to 1700. This style is simple, made from local woods and with little carving or design unless the piece was owned by a wealthy household. The William and Mary style of furniture was named after the reign of William III and Mary II in England from 1689-1702. The lowboy and the highboy were made popular during this time and vertical lines were emphasized. 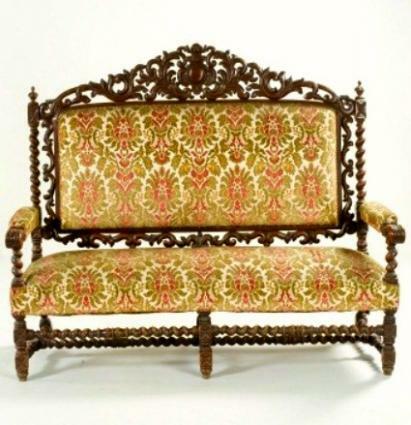 During the 1700s furniture became more refined, with more upholstery and carvings. The lines were graceful and proportions smaller than they had been in the past. Queen Anne style features a more refined version of the William and Mary style. It was in fashion from 1700 to 1755. Pennsylvania Dutch style reigned in Pennsylvania from 1720 to 1830. It is a favorite among collectors because of the colorful folk designs that are often painted on the pieces. The furniture built during the 1800s was increasingly more comfortable and more available. A simple version of French Empire style crossed the Atlantic and evolved into the popular American Empire style, circa 1815 - 1840. It was often made of mahogany or rosewood and had carvings in high relief. Shaker furniture was produced by the United Society of Believers, often called Shakers, from 1820 - 1860. This was a religious group that lived in small, self contained communities and believed simplicity was the way to peace. The furniture is simple and practical, made with wooden knobs, slat backs, and no decoration. Victorian furniture was embellished, ornate, and the first style to be mass produced. It lasted from about 1840 - 1910. The Arts and Crafts period lasted from 1880 to 1910 and is also called the Mission style. It was characterized by straight, simple lines and hand craftsmanship. Lines were blocky and squared off, with exposed joinery, hammered metals, and iron fastenings. Art Nouveau was also in style from 1880 to 1910 but in contrast to the Mission furniture, Art Nouveau was graceful and beautifully embellished. Patterns were very detailed and often mimicked those in nature; leaves, flowers, branches. Buying antique furniture can be expensive and it is important to do everything you can to make sure that it maintains its value. Some reproduction furniture has been made to look authentic in every way. A novice antique dealer can easily mistake a reproduction for the real thing and an inexperienced buyer can end up spending much more money than it is worth. This may sound funny but if it has a sticker that says Made in China, Made in Japan, etc. it is not an antique. Turn the piece upside down and look at the joints and construction. Reproductions will look new. Should You Refinish or Repair? Generally speaking it is not a good idea to have antiques refinished or repainted. Antique collectors love the look of the worn woods, the patina that is only built up by years of wear, and the character of the scratches and dents. You should always discuss your options with a certified antique appraiser. If an item needs restoration or repair it should be taken to an artisan that specializes in antiques. If it is a matter of replacing some missing hardware you can probably do it yourself but try to find hardware from the same time period. Keep you antique out of direct sunlight and dust it regularly with a soft cloth. Most antique furniture benefits from a light coat of lemon oil, carefully rubbed in, now and then. Your antique really doesn't need any special care unless the antique dealer tells you differently. Don't fall into the trap of buying antiques as an investment. Always choose items that you love and that will work in your home. Antique furniture is a wonderful link to the past and with some care it will last for centuries.